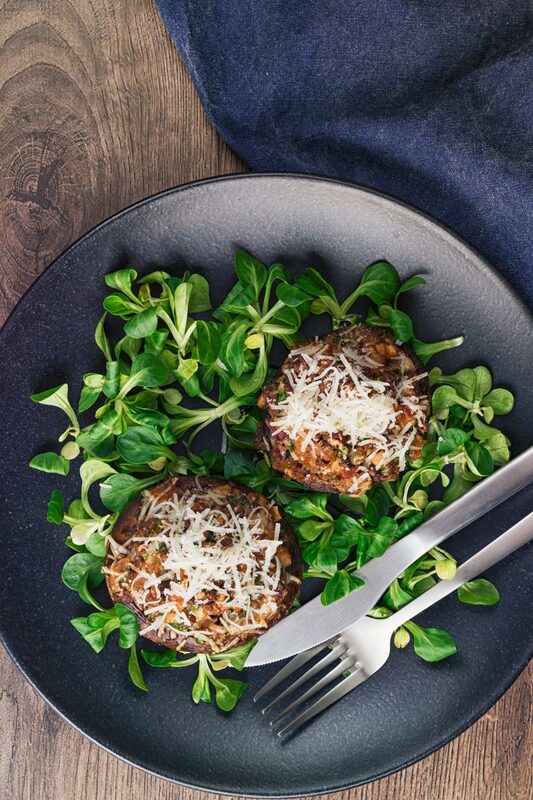 Stuffed mushrooms are no stranger here on my site… We are not talking about little appetizers, but full on meal centrepieces, we love them! These minced beef stuffed mushrooms are the first meaty shrooms I have here. I usually make them vegetarian, not for any reason other than the fact that mushrooms are already quite meaty. So the addition of minced beef and bacon make these super meaty! The stuffing is really very simple are the main ingredients of many a great meat sauce for pasta. The meatiness is joined by garlic, a little tomato, balsamic and parsley. Oh yeah cheese, we have both mozzarella and Parmesan. Is this ringing a bell yet? Seeing as I have mentioned my penchant for vegetarian stuffed mushrooms it would be remiss of me not to share. Cheddar Cheese and Brown Rice Grilled Mushrooms. Easy Stuffed Mushrooms With Roasted Red Pepper. And a quick appetizer stuffed mushroom to round things out! What Are The Best Mushrooms to Stuff? The best mushrooms for stuffing are either portobello mushrooms or field mushrooms. They are practically the same thing to be honest. 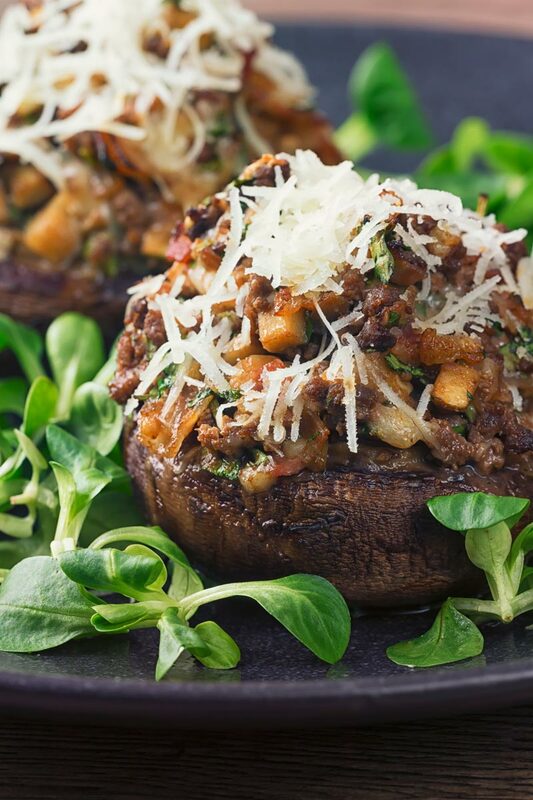 Portobello mushrooms are a mature version of the cultivated button mushrooms we all know. Field mushrooms, also known as meadow mushrooms are the often wild cousin of the portobello mushroom. Field mushrooms are often a little irregular in shape and do not have the same bowl shape. As a result, sometimes they are a little more awkward to stuff. 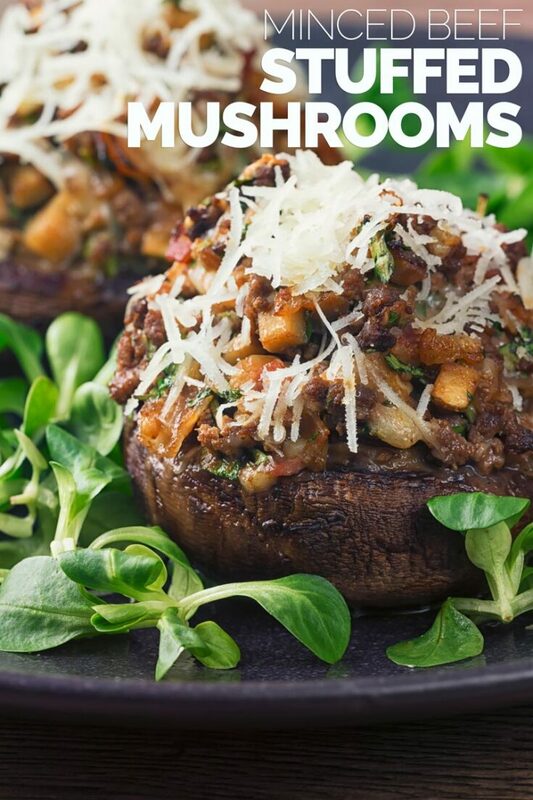 Both bake/roast or BBQ wonderfully, so whether you are cooking these beefy mushrooms or any of my vegetarian variants they are perfect. The great thing about stuffing shrooms is that they are great whether you are feeding a couple or feeding a crowd. They are a perfect scalable meal, you can also stuff them separately for picky eaters. 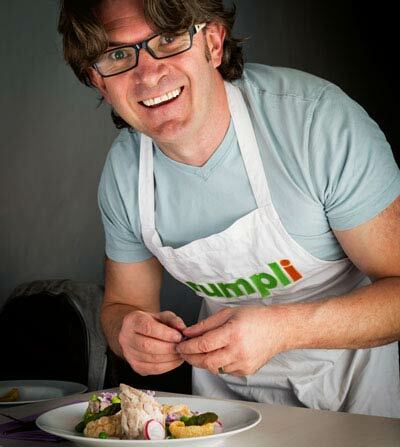 I would ordinarily serve two mushrooms per person for a light dinner and one for lunch. Pairing it up with some simple salad leaves to round it out. 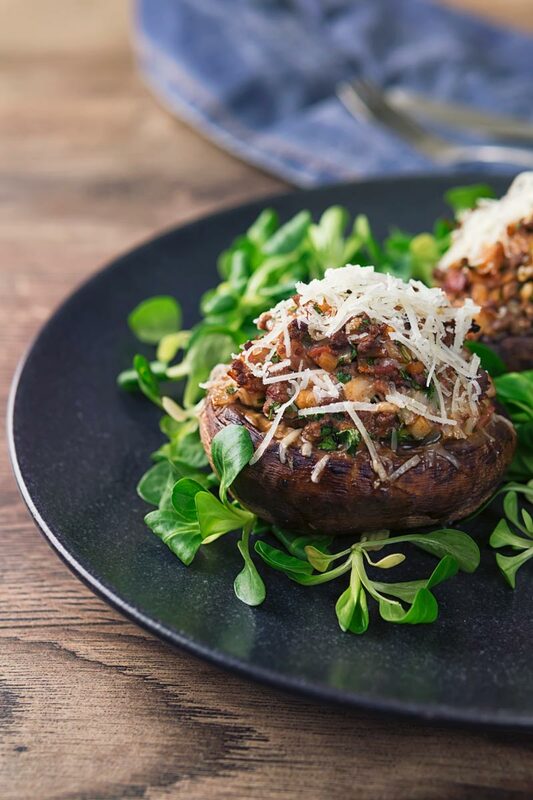 This minced beef stuffed mushrooms recipe is a supremely simple midweek family meal that is perfect for young and old alike. Dice the bacon and add it to a medium pan and cook for 5-6 minutes. 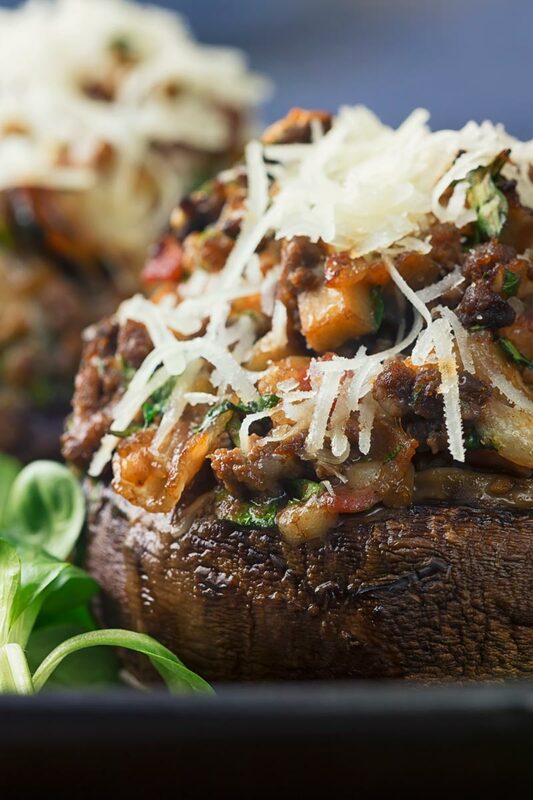 Remove the stalks from the mushrooms and finely dice. Add in the diced mushroom stalks, diced onion and garlic and cook for 5 more minutes. Turn up the heat to high and add the beef, a pinch of salt and a generous amount of pepper and stir until browned. Chop the parsley and add to the mix with the mozzarella cheese. Drizzle the mushroom caps with olive oil and then season them with salt. Spoon in the beef mix and then roast for 20 minutes at 180°C or 350°F. I think my husband that isn’t a mushroom crazy person like me might be converted by this one. Yum! Pinning it. We love mushrooms so I am not sure why I don’t stuff them more often! You have given me the push I need! I’m heading out to buy some portobellas! 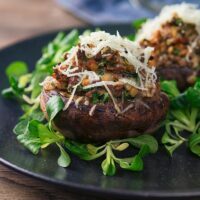 Wow I normally think of stuffed mushrooms as small bites usually passed around at catered events. These hearty stuffed mushrooms are a switch and a great option for dinner! I looove stuffed mushrooms but never tried them with bacon and beef. And adding balsamic and mozzarella? Outstanding! Thanks Susan, they are rather good! I used to make something similar to this but haven’t in so long – these look great and love how quick and easy they are.